If you noticed in our Fall Mantle Makeover post, we have a bin of books next to our fireplace. It contains the kids’ books. These aren’t all of our books, as the kids have book shelves in their bedrooms. This bin is for our seasonal rotation of books. I try to switch them out four times a year and put out books that relate to the current season. If a particular month has a holiday, then we also put those books in the bin. Here are the books we’re currently reading and some we’ve purchased this year for Halloween! This is definitely geared more towards boys, although Izzie does enjoy books about bugs and critters. We have a ton of Fly Guy books. They’re a big hit. 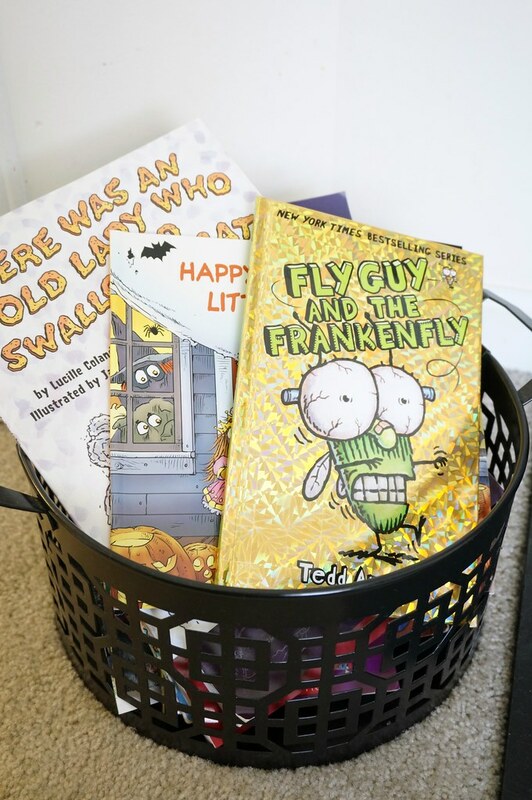 The Fly Guy series follows a little fly named Fly Guy and his friend Buzz (a boy). Since the boys read for 20 minutes every day, I put a book in each of their back packs to read during after school care. This Fly Guy book has been in their back packs multiple times since the beginning of the month. 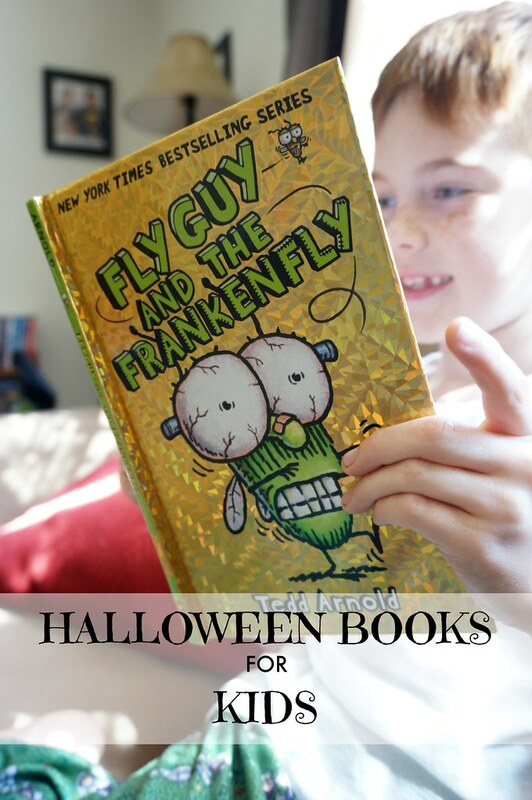 We started to buying Fly Guy books when our oldest was in 1st grade. They’re geared towards the 1st grade/2nd grade levels. The boys are kind of interested in zombies .. all of the time. So, when I put this book in the bin they snatched it up to read. The series revolves around a Dr. Roach who tells kids creepy stories. This one is, surprise, about zombie goldfish that take over a town. We haven’t checked out any of the other books, but the boys really enjoyed this one. This is one of our newest additions to the bin. This is about 8 friends who go on an adventure on Halloween night. In my elementary language arts classes, I’ve learned that kids develop their reading skills when they are challenged. Every few months, I purchase books a level or two higher than what they’re reading. I try to keep the books very interesting so they’re enticed to pick them up. This is definitely more advanced than the boys are reading right now, but this is something we can all read together.